It’s no secret that breweries and dogs are a popular combination, especially in the warm weather months. 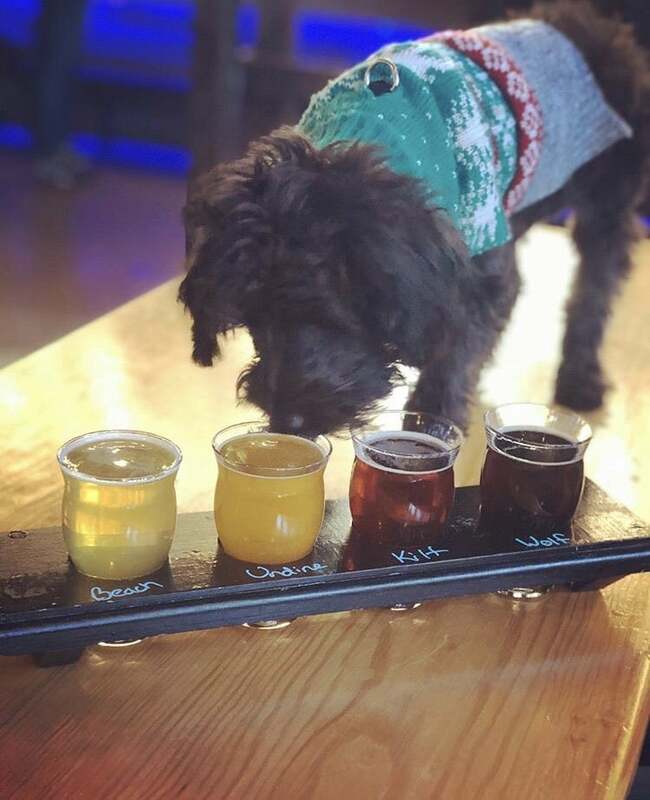 Finding a taproom to bring your four-legged friend to during the winter, however, is a bit more challenging. Luckily, Massachusetts has several beer makers who are as crazy about canines as they are about can releases. Below, we’ve highlighted ten of them with spacious taprooms that welcome dogs inside all year long. 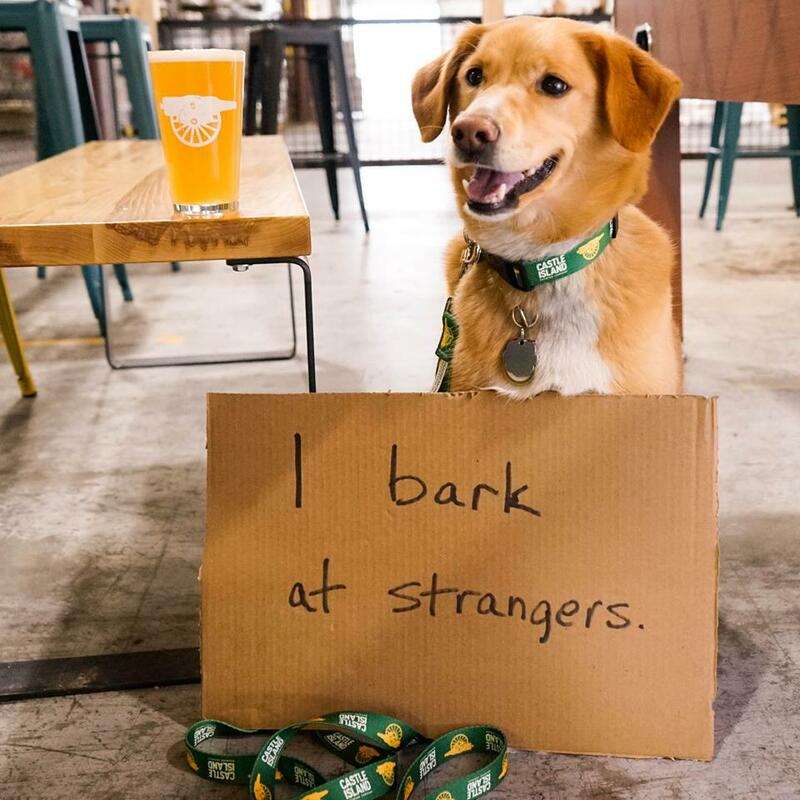 It should go without saying that responsible dog owners need to keep their pets leashed, respect that not all patrons are animal lovers, and recognize that some dogs aren’t suited for the noisy, crowded conditions in many taprooms. Use discretion. 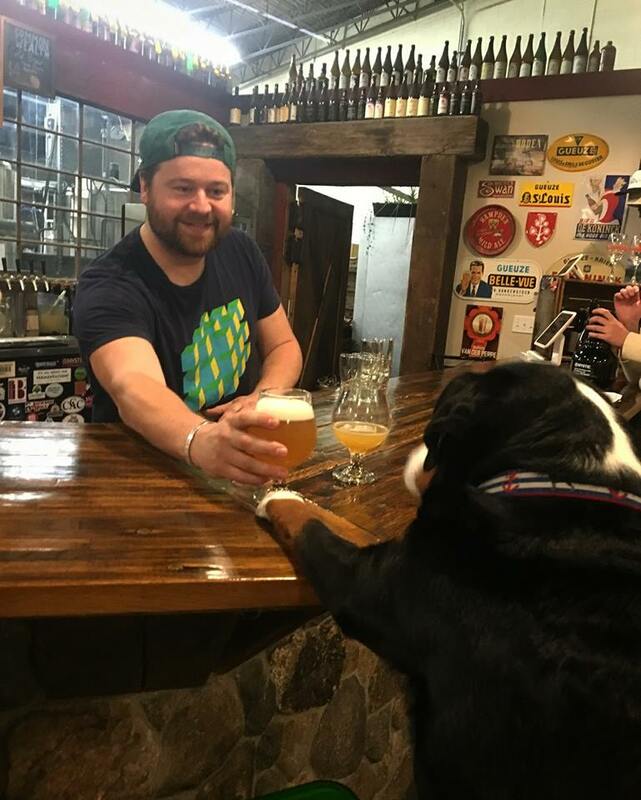 Though Trillium’s new Fort Point restaurant and brewery aren’t allowed to welcome dogs because of food service ordinances, their Canton brewery has been dog friendly since it opened in 2016. The spacious and open taproom is ideal for playful pups, and hand-crafted Alehound Dog Treats made from spent grains are aways on hand. Humans will appreciate the 20-plus beers on draft and the food trucks on weekends. 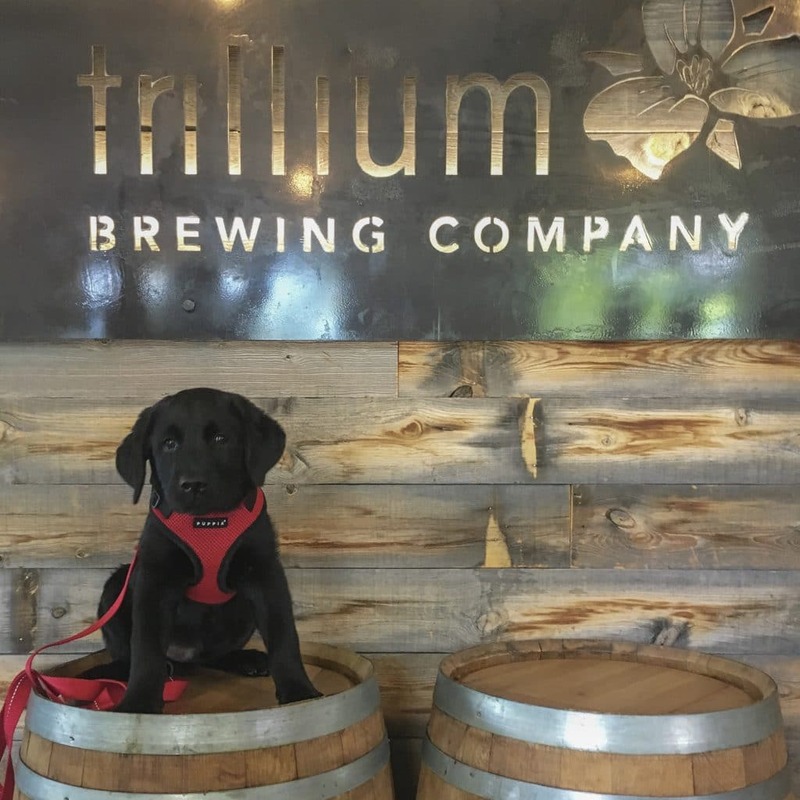 Louie the Black Lab enjoys a visit to the dog friendly Trillium Brewing taproom in Canton. According to the humans in charge of his Instagram page, Louie is a peanut butter enthusiast that hails from South Weymouth and licks everyone. “We love our furry friends, so we’ve decided to allow dogs in the taproom seven days a week” says the Castle Island website. Like other breweries, they’re expected to remain on-leash and need to be comfortable with crowds and children. Marketing Manager Janine Pohorely reports that the taproom staff loves four-footed visitors and always has plenty of treats on hand. For taproom visitors who walk upright, treats include 16 lines of the freshest Castle Island beer you’ll find anywhere, and an industrial-yet-cozy beer hall with communal tables, board games and a retail shop for takeaway beer. Founder Adam Romanow’s dog Bridgette, a Beagle-Golden mix he rescued almost 8 years ago, is CI Brewing’s unofficial mascot. 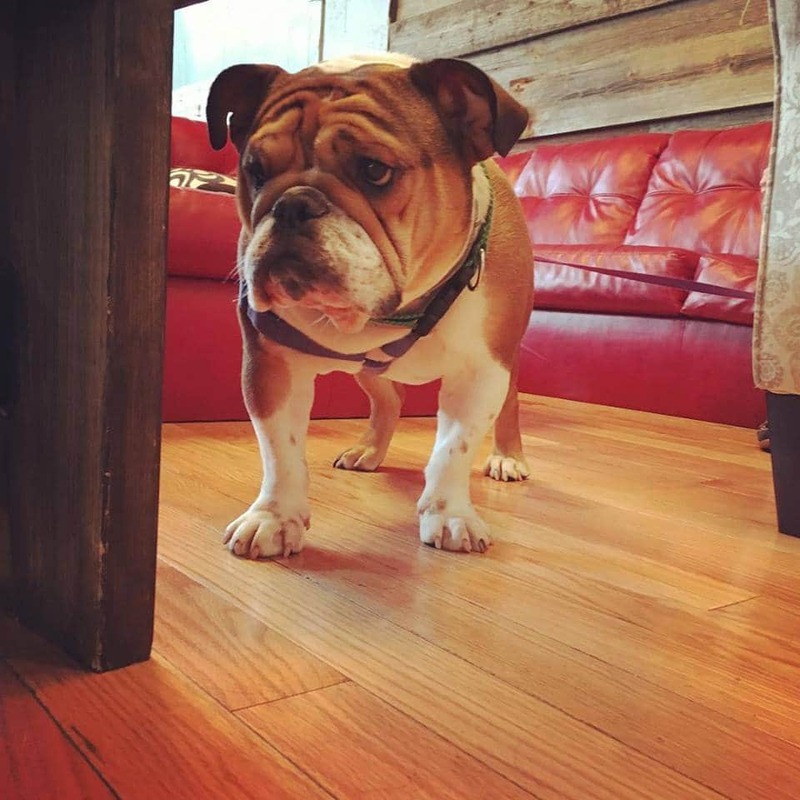 Dogs are also welcome at nearby Percival Brewing, whose large taproom and chill vibe provide a perfect place for pets and their owners to bond. “Dogs are a core aspect of our brewery,” says founder Phil Oliveira. “We even provide biscuits and water bowls.” They also provide small-batch beers with big taste, a rotating art gallery, and an on-premise coffee roasting business. And they’ve got leather couches, “for those lazy beer days,” with a variety of pour options ranging from flights to proper pints. 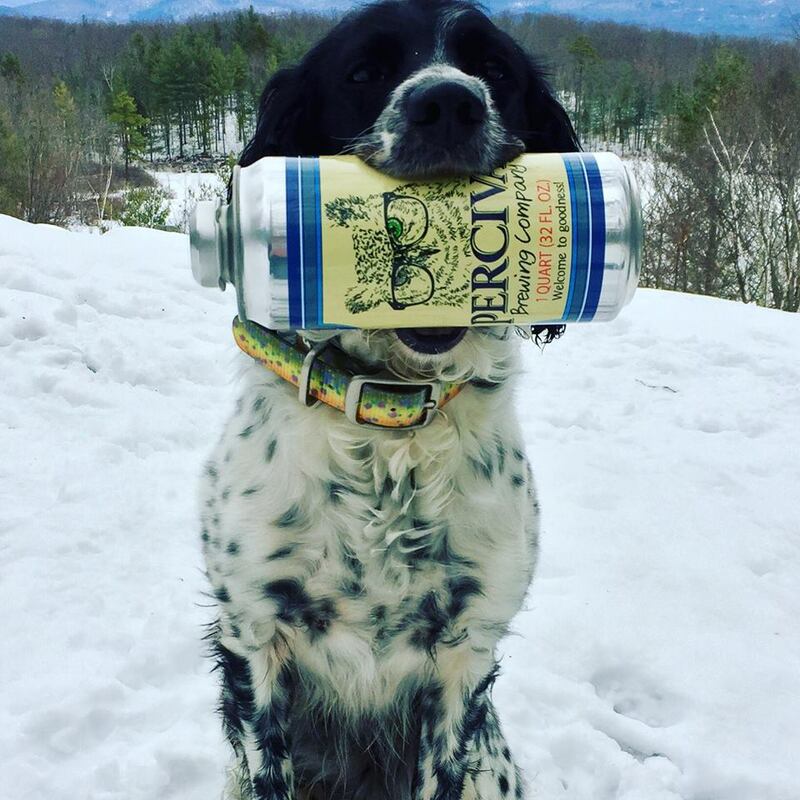 Be sure to fetch yourself a crowler to-go when it’s time to head home and feed Fido. Mayflower Brewing in Plymouth is so crazy about dogs that they actually named a beer after one of them, a rescued German Shorthaired Pointer named Otto that belongs to head brewer Ryan Gwozdz. He can usually be found waiting in the taproom by the treat jar. In addition to allowing dogs inside, Mayflower hosts fundraiser events like the one they have coming up on March 23rd with Survivor Tails Animal Rescue, a non-profit volunteer organization that rescues, re-homes, and rehabilitates unwanted, abused, and neglected dogs and cats. 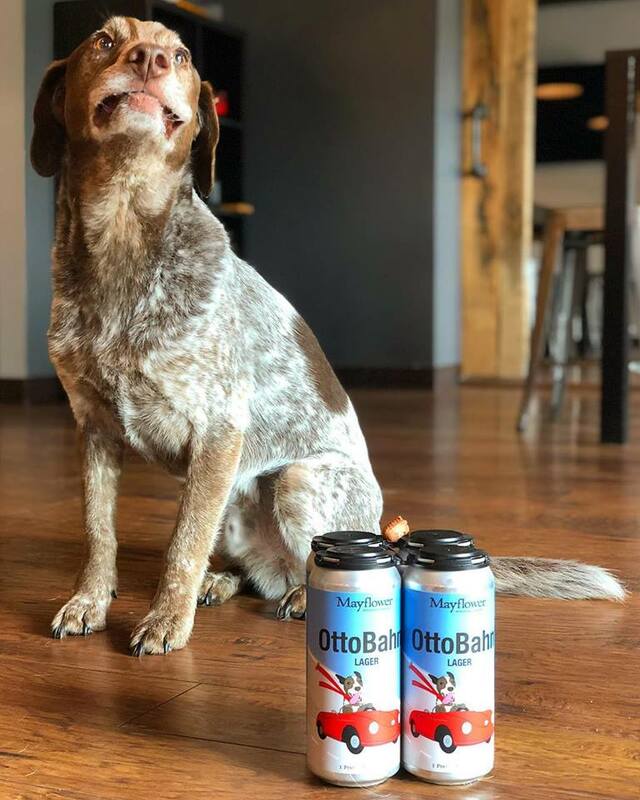 Mayflower Brewing’s OttoBahn Lager was named after the head brewer’s dog, Otto, a lovable German Shorthaired Pointer that was rescued through a group called Puppy Love Inc..
Another dog friendly brewery with the luxury of wide open spaces is Easthampton’s Abandoned Building Brewery, just a stone’s throw from Millpond Park. After playing with your pooch, you can kick back and grab a brew while they rest beside you. The 2,700 square foot space in an old mill building aptly named “the brickyard” normally has a relaxed vibe, but Friday and Saturday evenings feature live music, so it’s probably a good idea to plan your visit when it’s less noisy. 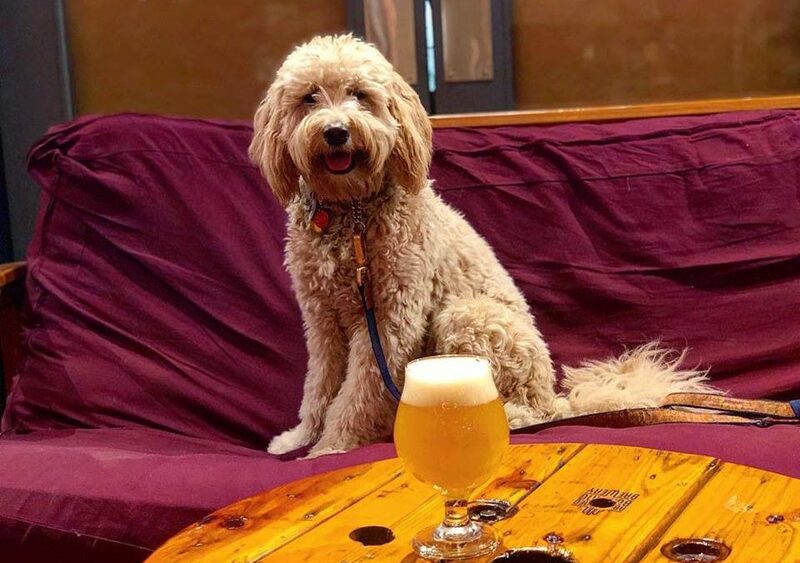 Lola, a nine-month old Goldendoodle who often tags along with her owner, one of the taproom’s beer slingers, is also the name of the brewery’s flagship Saison. Both are reasons to spend a relaxing winter afternoon at the Abandoned Building Brewery. A long-standing affection for canines, as well as a renovated and expanded taproom makes this brewery a fan favorite among its region’s craft beer loving dog owners. They even hold an annual Barks & Brews event every June that raises money for animals in need. Aside from the live music Thursday through Sunday evenings, which not all dogs are fans of, it’s hard to find a better place in Western Mass. 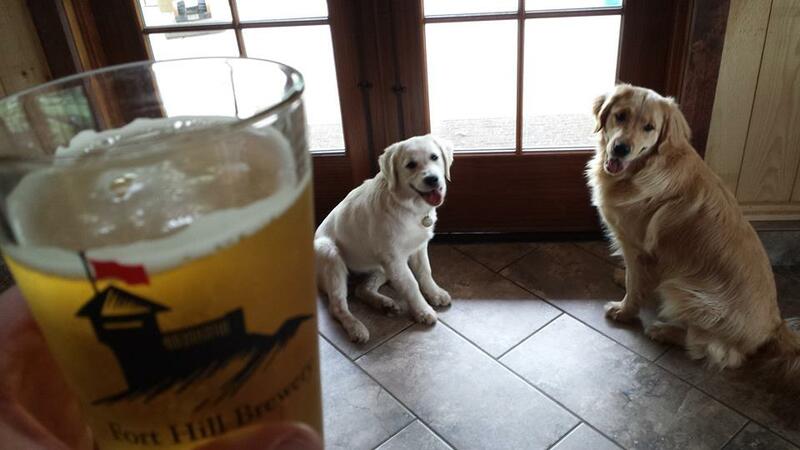 if you want to enjoy some tasty brews with your tail-wagging sidekick. Odel (right) and Luna-Tuna (left) are the official greeters at dog-friendly Fort Hill Brewery in Easthampton. You can bring your fur baby with you to the spacious and welcoming Down The Road Beer Co. taproom in Everett. Open seven days a week, and always dog friendly, the Mystic Brewery taproom has long been a year-round oasis for those with a passion for both craft beer and dogs. It’s a little more cozy than the others we’ve mentioned, so you may want to avoid special release days if your pooch is averse to crowds. In case you’ve been living under a rock, they’ve been crushing it with IPA offerings since adding the style to their repertoire a couple of years ago. Another bonus – they offer half pours. Chelsea’s Mystic Brewery earns high marks for its dog-friendly taproom, and its hazy, juicy IPAs. If you and your dog are up for a trip to the underworld, then head for River Styx Brewing in Fitchburg. There, “dogs are not just allowed, but adored.” The spacious taproom and its distinctive decor is family friendly and often full of kids playing games, so you’ll want to make sure your pooch isn’t skittish. “The pups make it feel like home for a lot of our visitors,” says co-founder Jackie Cullen. 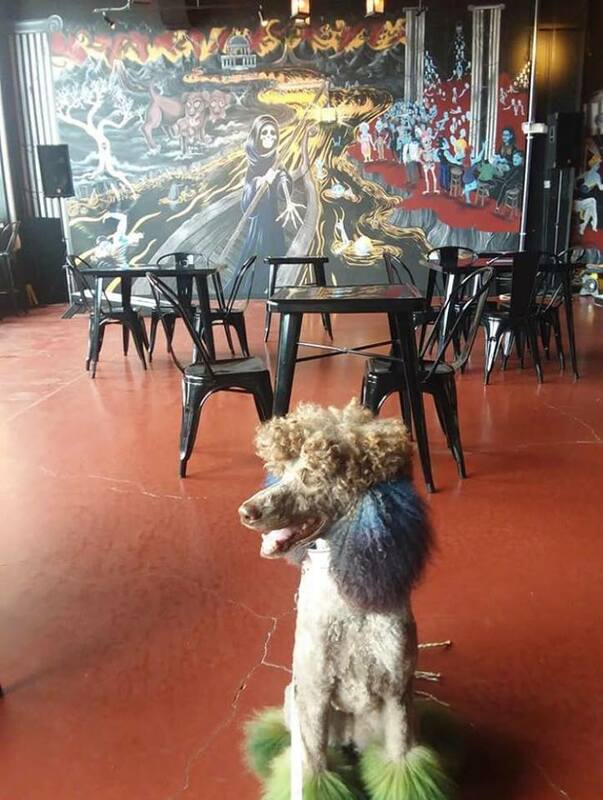 Poodles and phantoms alike enjoy the open spaces of the River Styx Brewing “underworld” taproom in Fitchburg. “The taproom is pooch and kid friendly as long as both play well with others,” says Navigation Brewing in Lowell. 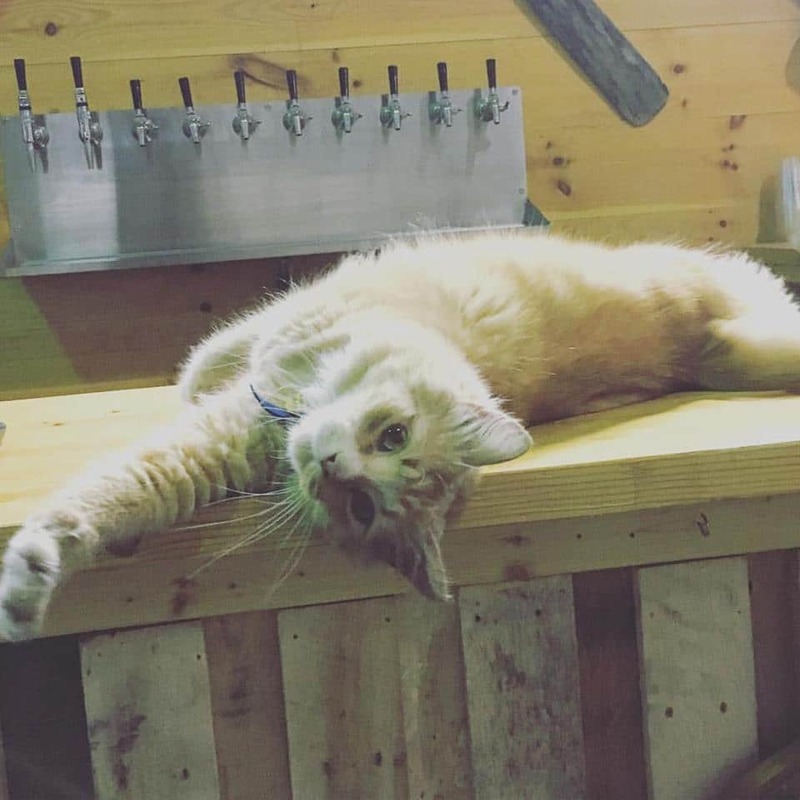 Getting along with the resident brewery cat, Trouble, is also a necessity, but given the roomy accommodations, relaxed vibe, and variety of small-batch beers it shouldn’t be too hard. Of course, you’ll need to keep your four-legged sidekick on a leash at all times. A bonus, if you’re the artsy type, is that the brewery is located inside Western Ave Studios, home to more than 300 working artists and a “First Saturday” open house at the beginning of every month. 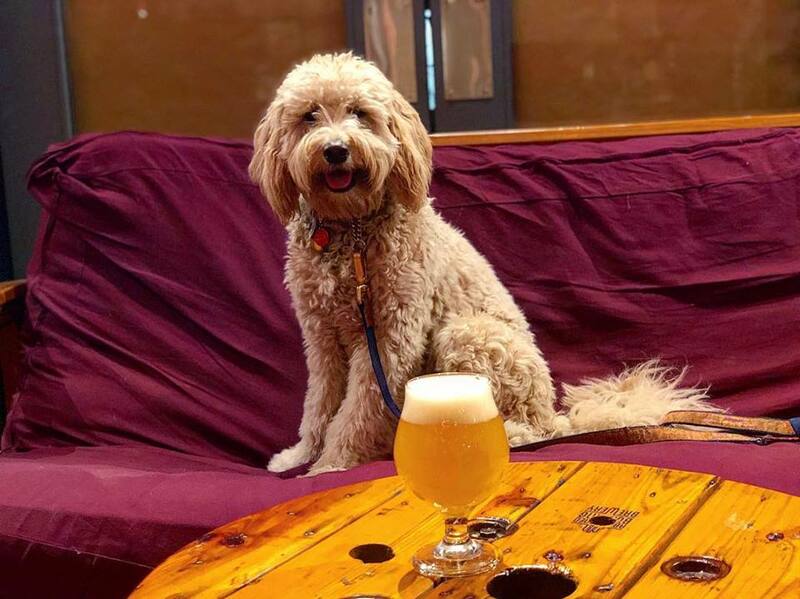 If your dog plays well with others, including kids and cats, then Navigation Brewing in Lowell is a great spot to relax and enjoy a few beers. Other taprooms we know of that welcome dogs inside year-round include 7th Wave* in Medfield,10th District in Abington, Black Hat Brew Works in Bridgewater, Bog Iron in Norton, Canned Heat and Troy City Brewing in Fall River, Cape Cod Beer (in its retail shop only), Devil’s Purse* in South Dennis, Independent Fermentations, Plymouth Beer Co.*, and Second Wind in Plymouth, Old Colony Brewing in Whitman, Untold Brewing in Scituate, and Widowmaker in Braintree, all in the southeast. 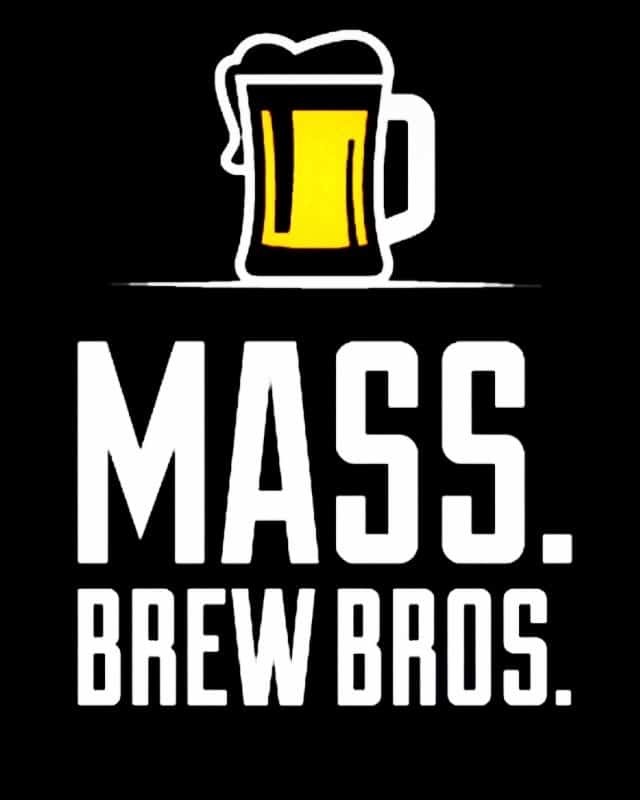 Up north, there’s Barewolf Brewing in Amesbury, Gentile Brewing in Beverly, Merrimack Ales* in Lowell, and Newburyport Brewing in Newburyport. Central Mass. has Cold Harbor in Westborough, Flying Dreams* in Worcester, Lost Towns in Hardwick, Purgatory Beer in Whitinsville, Rapscallion in Sturbridge, Seven Saws in Holden, and Tree House in Charlton. And out west, you’ve got Big Elm in Sheffield, Brew Practitioners and Building 8* in Northampton, Element Brewing in Millers Falls, New City in Easthampton, Honest Weight in Orange, Iron Duke in Ludlow, and Wandering Star in Pittsfield, though getting along with Fuggles, their brewery cat, is a prerequisite there. Tucker the 6-month old Schnoodle (a cross between a Schnauzer and a Poodle) is extremely playful, loves people, and enjoys a good Scottish Ale. You can follow his adventures on Instagram. Still others, such as Burke’s Alewerks in Hanover or Stone Cow Brewery in Barre, have fluid policies that sometimes allow dogs during non-peak hours when they aren’t particularly busy, but it’s best to call ahead and confirm. And there are probably others we’re leaving out. Post a message in the comments section below if you know of one. Many of the above breweries are also involved with various animal charities and often host special events. And dozens of others welcome dogs on their decks, patios, and beer gardens when weather permits. *Above breweries marked with an asterisk are tasting rooms, not taprooms, and don’t sell full pours for on-site consumption. Be sure to check that pet policies haven’t changed before planing your trip. For example, Lord Hobo Brewing in Woburn, which recently converted to a brewpub, no longer allows dogs inside. Nor does Drunken Rabbit in South Hadley, or Bent Water in Lynn, due to issues with their city/town ordinances. Always a good idea to call ahead and avoid disappointment. Barnstable Brewing should be on this list as well.